Is there a genre Edgar Wright and cohorts in crime Simon Pegg and Nick Frost haven't tackled? Victorian period romance, I suppose. Otherwise, it's all fair game for the Cornetto Trilogy boys. Shaun of the Dead cut a swath through horror and the house that Romero built, years before the New Zombie Renaissance. Hot Fuzz fired "two guns whilst jumping through the air" with slick style, shooting up '80s and '90s action classics, police procedurals and buddy cop flicks. 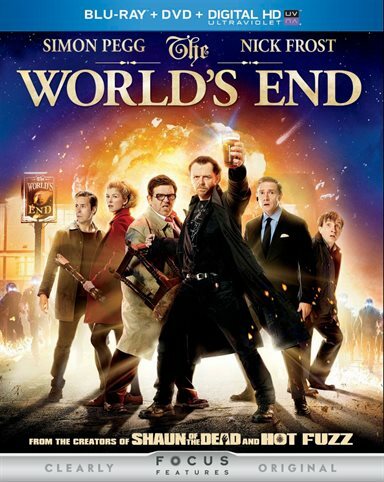 And now there's The World's End, a hilarious send-up of sci-fi actioners, alien invasion movies, arrested development comedies, and even disaster blockbusters and post-apocalyptic wasteland epics. No genre is sacred; no genre is safe. Just the way Wright fans like it. The World's End isn't as pitch perfect as Shaun of the Dead -- if you never warm to Pegg's insufferable manchild, you'll have a much harder time warming to the rest of the film -- but it's sharper and a wee bit smarter than Hot Fuzz, closes out the trio's trilogy of genre comedies with gusto, and delivers some of the biggest laughs of the year. Enough to declare it among the best comedies of 2013. Thirty-eight-year old Gary King (Pegg) is deep in the throes of arrested development, obsessed with the good ol' days when he and his inseparable band of high school troublemakers -- Steven Prince (Paddy Considine), Oliver "O-Man" Chamberlain (Martin Freeman), Peter Page (Eddie Marsan) and best friend Andy Knightley (Frost) -- attempted to complete the Golden Mile: patronizing all twelve pubs in their hometown, Newton Haven, in a single night. The five teens failed to finish the Mile, of course, and soon after went their separate ways. Haunted by the glory that could have been, Gary tracks down his old chums twenty years later, cons each of them into returning with him to Newton Haven and, finally, at long last, put right what once went wrong. Twelve pubs. Twelve pints. There's just one problem. The fair folk of Newton Haven are acting awfully strange. How strange? As the gang soon discovers, the townspeople have been replaced by identity-swiping alien robots hell bent on what can only be described as a weirdly peaceful hostile takeover. Now, with the help of Oliver's sister Sam (Rosamund Pike) and a local named Basil (David Bradley), Gary and his friends have until dawn to thwart the body snatchers' plans, go toe-to-toe with the aliens' charming leader (Pierce Brosnan) and save the planet. For Gary, though, it's all secondary to the real task at hand: completing the Golden Mile. Never one to repeat himself, Wright strikes a completely different tone from anything he's done before, refusing to dip into what could easily become a very familiar bag of tricks. The World's End is brash, brazen and bound to a cocksure swagger that's all King, and yet all at once breezy and effortless. One-liners fly fast and fierce. Instantly quotable quotes litter the streets. Clever pop culture riffs await. Rapid-fire rants and diatribes erupt at every turn. A welcome dose of heart enters the fray in the nick of time. Subtle genre satire births even more subtle genre satire, and that's not even counting the more obvious jabs film-fans will immediately skim off the surface. When I wasn't busy laughing, I found myself sitting back and simply marveling at the sheer craft of it all. There's far more to End's comedy beats and action beat-downs than meets the eye, and carefully concealed in-jokes and references are hidden everywhere... at least for those willing to search them out through multiple viewings. (My favorite? Mild spoiler alert: take note of how closely the progression of events of the boys' first Golden Mile trek coincide with their present-day, alien-infested run. Wright practically maps out the entire movie from the outset.) My go-to comedies are always gifts that keep on giving, and I can't imagine exhausting The World's End any time soon. I haven't come close. It's a bit darker than Wright's usual comedies too, with a self-centered hero-in-the-making that verges on unlikable (intentionally), a lovable lug who's abused and manipulated by a poor excuse for a friend, and a story that doesn't guarantee its entire ensemble will make it out in one piece. Shaun of the Dead edged nearer and nearer to heartache as it hurtled along, pulling back at the last minute with an "all's well that ends well" finale after some sad business during a grim last stand. The World's End is a riot to the bitter end -- don't you worry -- but it doesn't flinch or back down, sidestepping a traditionally happy end-cap in favor of something much, much more satisfying. (Not to mention wholly unexpected.) I'd even go so far as to say the third act approaches Python-level brilliance, not just subverting a dozen sci-fi tropes, but one-upping them altogether. Compare Oblivion's climactic showdown to End's. There's no contest. Wright's face-off and endgame is richer, more thought-provoking, more intelligent, and possibly even more poignant science fiction. It just so happens to be hilarious. God forbid. Add to that a killer cast, terrific visual effects, a fantastic soundtrack, and thrilling, blazingly choreographed action scenes and you have something more than the best comedy of the year; you have one of the best science fiction films of 2013. The World's End invades Blu-ray with a faithful, first rate 1080p/AVC-encoded video transfer that's as striking as any Cornetto fan could hope for. Those concerned that a disc jam-packed with special features might result in a problematic, underwhelming presentation can cast all worry aside. Edges are crisp and clean, without any pesky ringing; fine textures are revealing, with exacting close-ups and plenty of grime to go around; and grain is intact and pleasant on the whole. Universal's DTS-HD Master Audio 5.1 surround track doesn't play by standard comedy rules. Big, bold and bombastic, the film takes any and every advantage of the entire sound field, firing off directional shots and launching sonic attacks as if the end of the world really was imminent. Feature Commentary: Writer/director Edgar Wright and co-writer Simon Pegg serve up the first of three, count them three audio commentaries, and it's an entertaining opener. Naturally the pair focus on the story, characters and comedy, but that doesn't stop either one from chasing tangents and a few good laughs. Technical Commentary: Next up is Wright and director of photography Bill Pope, who deliver a technical track that dissects the look of the film, its cinematography and effects, and other aspects of the shoot as seen from behind the camera. It's a solid commentary; not as funny as its sister tracks but informative and, despite its drier bits, quite engaging. Cast Commentary: Pegg returns with co-stars Nick Frost and Paddy Considine for a laugh-out-loud third commentary, although it isn't nearly as extensive as its predecessors, which strike a better balance between production detail and humor. U-Control Storyboard PiP: View The World's End storyboards alongside the final cut of the film. It's not a full Picture-in-Picture suite per se, but with so many special features on tap, it hardly matters. Completing the Golden Mile: The Making of The World's End: This high definition Blu-ray exclusive documentary is a must-see, inching through the film and hitting on virtually every aspect of the production. There's some overlap with Wright and Pegg's feature commentary, but not enough to make either extra redundant in the least. Filling in the Blanks: The Stunts and FX of The World's End: Delve into the film's action, stuntwork and visual effects via this secondary documentary. Pairs perfectly with "Completing the Golden Mile." VFX Breakdown: A second visual effects featurette that covers additional ground. Edgar & Simon's Flip Chart: Get a unique glimpse into the writing of the screenplay. Director at Work: Wright is thrust into the spotlight by key members of the cast and crew. Pegg + Frost = Fried Gold: Pegg and Frost receive the same treatment. Friends Reunited: A truncated EPK with bits culled from "Completing the Golden Mile." Three Flavours Cornetto Trilogy: The tasty trilogy treat in all its glory. Animatics: Animatics for two scenes. Hair and Make-Up Tests: Early tests with the actors. Rehearsal Footage: Pre-shoot rehearsals with the cast. Stunt Tapes: An overview of three different stunt-heavy sequences. There's Only One Gary King: Osymyso's Inibri-8 Megamix: Music remix montage. Signs & Omens: The film's easter eggs revealed! Deleted Scene: A single deleted scene, and an inconsequential one at that. Outtakes: Funny, but standard gag reel stuff. Alternate Edits: A series of alternate takes. Bits and Pieces: More alternate takes and shots. Trailers & TV Spots: Three trailers presented in HD and three TV promos in SD. TV Safe Version: Four minutes of the film edited for all-ages access (and further laughs). Galleries: Photographs, concept art, animatronics, prosthetics, theatrical posters and pub signs. Trivia Track: Not enough, you say? Alright then. How about yet another way to watch the film? This time with a pop-up trivia track featuring every last nugget of info that doesn't have a home elsewhere on the disc? With The World's End, Wright further establishes himself as one of the preeminent comedy directors working today. The presence of Pegg and Frost ups the ante, of course, and their smartly cast co-stars certainly help. The final(?) entry in the trio's unofficial Cornetto series is a blast from start to finish; a wee bit better than Hot Fuzz by my estimation, and almost as flawless as Shaun of the Dead. Opinions will vary I'm sure, but there's a lot here to love, and a lot more to laugh at across multiple viewings. Universal's Blu-ray release arguably tops the feature film, with an excellent video presentation, a terrific DTS-HD Master Audio 5.1 surround track and hours upon hours of special features, including three audio commentaries, two high definition production documentaries and much, much more. One of the year's best films arrives with one of the year's best Blu-rays. Download The World's End from the iTunes Store in Digial HD. For more information about The World's End visit the FlickDirect Movie Database.